The recently acquired Puma tail boom was fitted onto the cab of Aerospatiale Puma HC Mk 1 XW208 on 26 July, 2018. The lift was completed by local contractor Gillivers Haulage, who collected the airframe from RAF Cranwell back in February 2018. The work on this particular Newark Air Museum restoration project is befitting from significant input and advice from the wider RAF and UK helicopter community; and in the case of the recent tail boom acquisition from the staff and volunteers at East Midlands Aeropark. Puma XW208 is pictured with the tail boom now fitted. The familiar sound of the twin rotors of the Chinook will be back at Wings & Wheels on Saturday 25th and Sunday 26th August this bank holiday as the Chinook Display Team returns to Dunsfold Aerodrome with the much-loved helicopter. The team is based at RAF Odiham in Hampshire and aims to demonstrate the RAF Chinook’s capability. As well as part of the RAF Chinook Display Team, the crew are also part of a fully operational Squadron where they combine their daily training demands with practising their display sequence. The Chinook Display crews have, for many years, flown with painted helmets but these have tended to be simple in nature and consisting of stripes of the British National or Squadron colours. For the RAF100 season the team felt that the time was right for something new. The helmet was designed by team co-pilot Flt Lt Andy Donovan and incorporates the eagle from the Royal Air Force crest as its biggest feature. The 2018 formation sequence consists of 17 different manoeuvres including, the opening Run in to Crowd Centre for Nose Over with Turn Away, Pedal Turn, ‘Roller Coaster’ (Nose Over followed by Nose Over), 360 degree Wingover at Crowd Centre, 180 degree Nose Down Quickstop, Taxi Sideways for Crewman Wave, 540 degree ‘Gorni’ Corkscrew, 315 degree Spiral Descent to break from Crowd before they finish with the Over the Shoulder Departure. 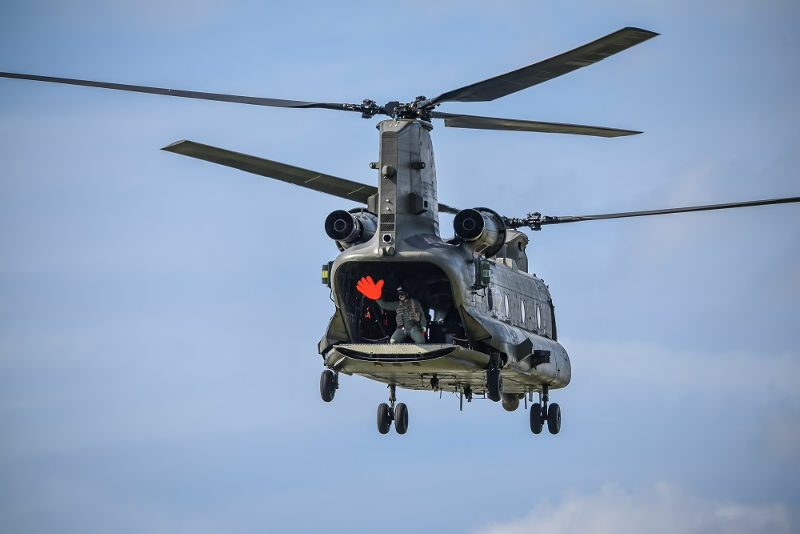 It’s a thrilling display which not only shows how skilful the pilots are, but the versatility and manoeuvrability of the Chinook helicopter used for trooping, resupply and battlefield Casualty Evacuation (CASEVAC) and for carrying internal and/or underslung loads. Visitors to Wings & Wheels can also enjoy other air displays including show favourites the Red Arrows, Battle of Britain Memorial Flight (Lancaster, 2 x Spitfires), the Tigers Parachute Team, The Blades, Jet Provost, Hurricane, Strikemaster, O’Brien’s Flying Circus and Fireflies Aerobatic Team, accompanied by witty and knowledgeable commentary from aviation experts and display pilots. The Newark Air Museum will be hosting a two day event to celebrate the Shackleton Boys book launch, by Grub Street who has published a range of such books featuring different aircraft types and stories from their aircrew. 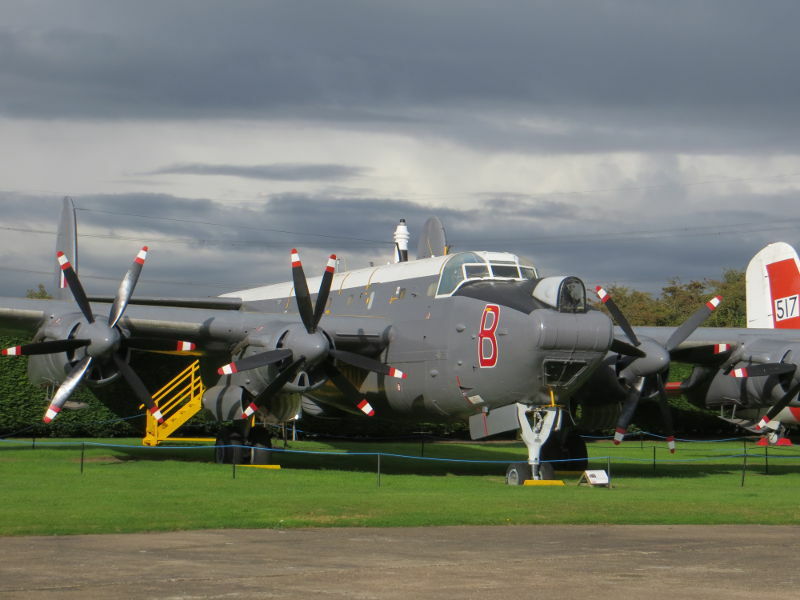 The event will take place on Saturday 1st & Sunday 2nd September 2018 – 10am until 5pm each day (last admission at 4pm), and it will be centred around Avro Shackleton MR.3 Phase 3 WR977 that was dismantled and moved to the museum by road in spring 1977. To this day this is still the largest aircraft dismantling project ever undertaken by the museum and its members. It is planned that eighteen (18) contributors to the book will be in attendance to sign copies, meet each other and also meet and talk with the museum visitors. Details of the reunion aspect of the event are being co-ordinated via the author Steve Bond and the publishers Grub Street. Amongst the Shackleton veterans there will be four or five people who flew Shackleton WR977 will be attending, including one who was aboard when it sent out to find Sir Francis Chichester in 1967. The museum anticipates that there will be a number of visiting displays and exhibits that will add to the maritime reconnaissance nature of the event. On both days of the event there will be a flypast by Spitfire aircraft from the Battle of Britain Memorial Flight. Bournemouth Ready for Jet Propelled Stellar Take Off! This year’s much anticiated Bournemouth Air Festival will star 20 jets, 29 aircraft, eight Tigers and two helicopters – that’s not fogetting the landmark dusk displays and unique Night Air family entertainment…all of this by the sea and completely free! Four days of sky high aviation action will see the incredible world famous RAF Red Arrows display on Thursday, Friday & Saturday, the RAF Chinook back for three days, the AerosuperBatics Wingwalking Pair demonstrate their breath-taking skill and, in a first for Bournemouth and the South Coast, the Breitling Jet Team. New this year the Super Pitts Muscle Plane, piloted by flying ace Rich Goodwin, will showcase daredevil routine, aerial manoeuvres and high energy aerobatics. Also, new to the flying display programme, Team Raven’s unique dynamic formation aerobatic display will leave the crowds wanting more! Back to impress the Tigers Parachute Display Team will be landing on the award-winning beach during the day and performing a new special dusk jump on Friday. Night Air flying will also see a beautiful balletic performance from the FireFlies and Twisters. If you thought that as a pair they were impressive, wait until you see four aircraft gracefully lighting up the skies! Not forgetting Night Air favourite Otto the Helicopter and, back for four days, The Blades, with the festival‘s only female pilot Kirsty Murphy. A special Vintage Weekend remembers the end of WW1 and the centenary anniversary of the RAF. Dance, live music and classic cars will be complimented by a plethora of awesome aircraft including the Battle of Britain Memorial Flight Hurricane, Spitfire and Dakota, SallyB, a heritage fly past from the Vampire Pair and Strikemaster Pair and a poignant poppy drop planned for the Bremont Great War Display Team. A jam-packed aviation line-up wouldn’t be complete without Night Air entertainment. On Thursday, Friday and Saturday evening enjoy family fun in the Lower Gardens, tribute acts on the Bournemouth stage with music from the UK Bee Gees (Thursday), Stevie Wonderband (Friday) and U2-2 (Saturday) Unarmed Combat demonstrations from the Royal Marines and fabulous fireworks on Friday and Saturday (10pm). Regarded as the UKs most successful civilian air show with brilliant day and night time entertainment in the skies, on land and in the evening, the 11th Air Festival is ’more than just an airshow’ and set to be the event of the summer! Wings & Wheels is delighted to confirm the Lancaster and two Spitfires from the Battle of Britain Memorial Flight will be displaying on both Saturday 25th and Sunday 26th August, at the historic setting of Dunsfold Aerodrome, near Guildford in Surrey. Commemorating those who have fallen in the service of this country and displaying priceless artefacts of our national heritage, the Battle of Britain Memorial Flight will fill the skies over Dunsfold. 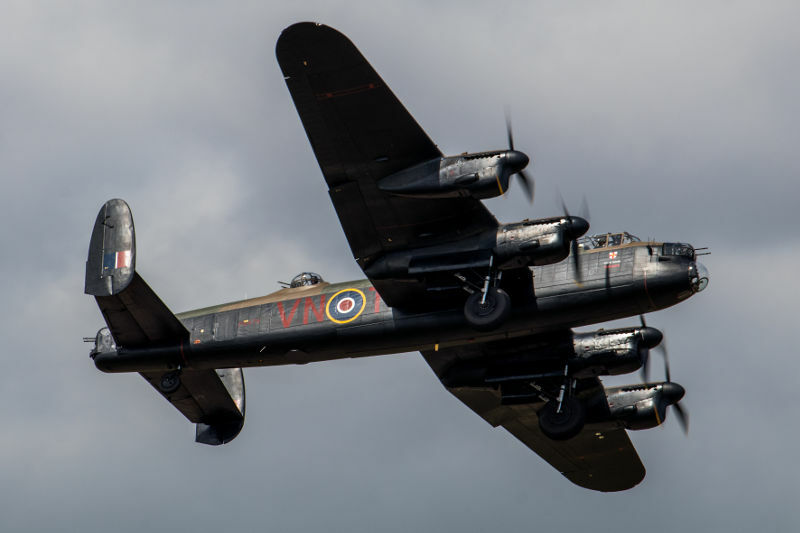 The Avro Lancaster is the most famous and successful RAF heavy bomber of World War Two and is a legend that lives on today. It could carry a maximum bomb load of 22,000 lb, its maximum level speed with a full load at 15,000 feet was 275 mph and it could cruise routinely at altitudes above 20,000ft at a range speed of 200 mph. With a full bomb load the aircraft had a range in excess of 1,500 miles. The Lancaster’s performance, its ruggedness, reliability and to many its sheer charisma, endeared it to its crews who were proud to fly this famous thoroughbred. The Spitfire was produced in greater numbers than any other British combat aircraft before or since the War. 20,341 Spitfires were built in 22 different variants (excluding the navalised Seafire) and the aircraft remained in production for 12 years. Spitfires fought in every operational theatre of the War and remained in RAF front-line service up to 1954. The Spitfire played a major part in achieving ultimate victory in World War Two and deserves its place as probably the most successful fighter design ever, and certainly as the most famous and charismatic of all time. The motto of the BBMF is ‘Lest We Forget’ and the team more than live up to this by flying the most famous RAF aircraft of any decade, ensuring we do not forget the ultimate sacrifice made by the young men who went into battle. The display team consider themselves a “museum without walls” and a “living and breathing tribute” to those who paid the ultimate sacrifice. Visitors to Wings & Wheels can also enjoy other air displays including show favourites the Red Arrows, Chinook, the Tigers Parachute Team, The Blades, Jet Provost, Hurricane, Strikemaster, O’Brien’s Flying Circus and Fireflies Aerobatic Team, accompanied by witty and knowledgeable commentary from aviation experts and display pilots. 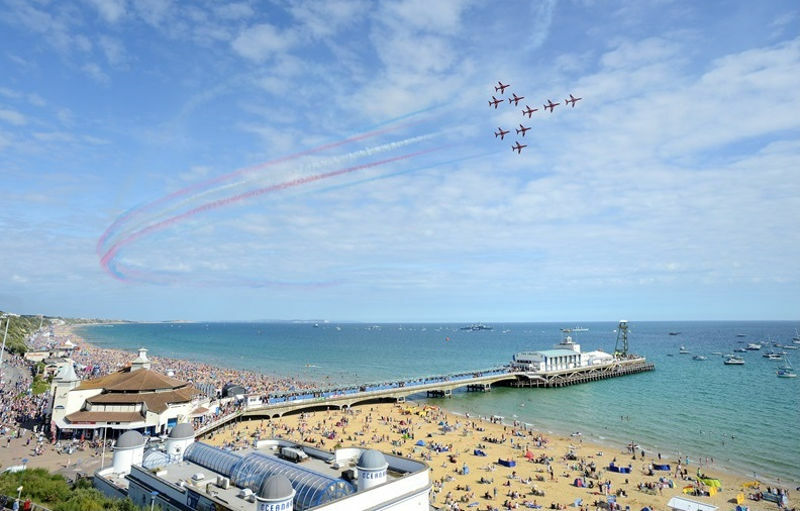 Breitling Jet Team Confirm Only UK Display Date – And It’s Bournemouth! Air Festival organisers are feeling magnifique as the world-famous Breitling Jet Team have been confirmed to display at this summer’s aviation extravaganza. The jet team have not displayed at a UK civilian airshow for nearly 15years, they have never displayed on the south coast of England and, currently, the Air Festival is the only place you will see them this year in the UK! Their three day displays and one Night Air dusk show have been made possible by long-standing festival supporter Morgan Sindall Investments Limited and this year will also be supported by Morgan Sindall Construction and Infrastructure (MSIL & MSC&I). Duncan Johnston Development Director on behalf of Morgan Sindall Investments said; “We have supported the Air Festival since 2011, the event itself continues to be innovative and leading and we really wanted to make sure this year there was something for people to talk about – what better than making the event international again with the Breitling Jet Team! 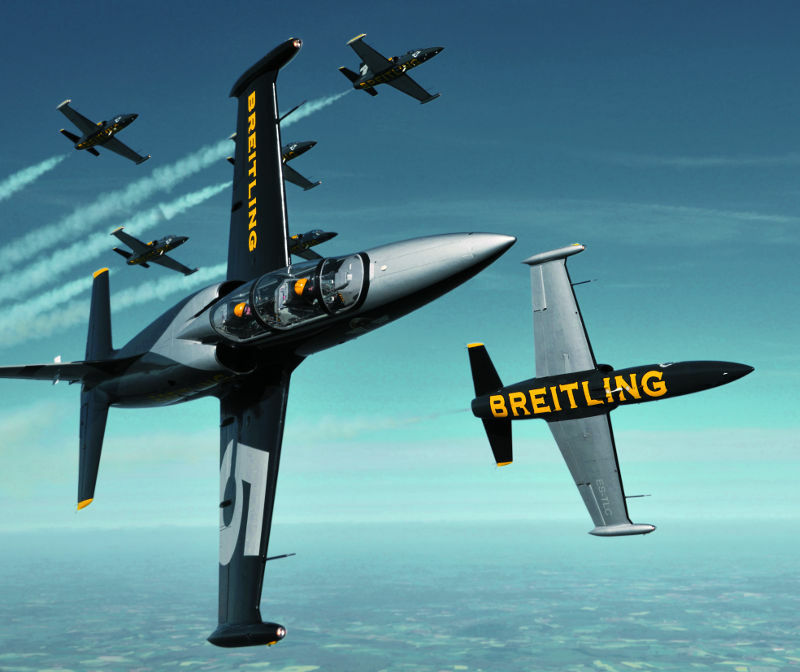 The Breitling Jet Team are Europe’s largest professional civilian jet display team, based in Dijon France the team pilot seven Czech Aero L-39 Albatros jets. Their fast and powerful aircraft are piloted by incredible flying aces representing precision, speed and daring skill – at times the aircraft is within 3metres of each other at speeds of over 700km/h. The team have displayed across the globe – from the Far East, South East Asia and the Middle East to Eastern Europe and, most recently, a two-year tour of North America and now they can add Bournemouth to the list! Regarded as the UKs most successful civilian air show with brilliant day and night time entertainment in the skies, on land and in the evening, the 11th Air Festival, 30th August – 2nd September, is certainly set to be the event of the summer! For details visit www.bournemouthair.co.uk or follow the team on social media. Flypast and street food are on the menu at Cosford next Weekend! With just days to go until the annual Cosford Food Festival and with the warm weather showing no signs of fading, organisers are gearing up for their biggest and best event yet! This year’s festival is packed with over 90 local food and drink producers, a busy line-up on the cooking demo stage and live performances from the Cosford and Shawbury Military Wives Choir. Plus, there will be plenty of hand-on foodie fun and entertainment for families and a Spitfire flypast on Saturday as the cherry on top! Taking place on 21 and 22 July, the festival is being held in the unique setting at the Royal Air Force Museum Cosford, with the VC10 and Hercules aircraft acting as a backdrop to the bustling food market. There will be plenty of delicious food for visitors to buy and enjoy at the festival, with some of the best street food vendors in town cooking up flavours from around the world. The diverse menu on offer will include everything from African, Indian, Italian, Greek and Japanese cuisine to a taste of the ocean with softshell crab to tempt visitors. Plus, gourmet burgers, stonebaked pizzas and gourmet vegan street food means there really is something for all festival goers to enjoy. As well as a wide choice of locally brewed beverages to accompany the great food on offer, why not wash your lunch down with a glass of fizz from the Champavan, a little tipple from the Gin Spot, or perhaps a funky summers cocktail courtesy of the Beetle Juice bar! Freshly ground coffee and refreshing cold drinks will be available from converted vintage vehicles and for those who can’t resist something sweet, traditional dairy ice creams, crêpes and huge selection of desserts to go including brownie and pancake skewers, will all be on offer to tempt foodies. A guaranteed highlight on Saturday afternoon will be the unmistakable sound of a Second World War aircraft, as the Battle of Britain Memorial Flight Spitfire flies overhead during a spectacular flypast (scheduled for 2.21pm weather permitting). With a jam packed programme of demonstrations over the festival weekend, visitors can learn from the experts on how to prepare, cook and present a range of exciting dishes. Festival organisers have signed up some exciting new chefs for this year’s festival including celebrity chef Cyrus Todiwala OBE as well as Stu Harmer – Ex-Flight Sergent, RAF Chef. Both are contributors to The RAF100 Cookbook, created by RAF personnel spanning 100 years, 100 countries and 100 recipes, celebrating the centenary of the RAF. Visitors can also sample dishes and purchase signed copies of the book from the RAF Tips and Tasters stage. Plus, local speciality chefs will be showcasing their passion for great food, ensuring the demo stage has an entertaining and varied line up. Visitors can sit back and relax with a summer’s drink in hand, whilst dining alfresco and enjoying some of the weekend’s entertainment. Kick starting the weekend’s live music is festival favorite and acoustic musician Anthony Doyle, who will be encouraging visitors to sing along and even have a go with the musical instruments. Bringing a touch of vintage sounds to the festival will be the fabulous The Bluebird Belles, a 1940s vintage trio who specialise in retro sounds. After proving popular last year, The Dirty Rockin Scoundrels are back…bringing you the best Rock ‘n’ Roll music of the 50’s and 60’s – that’s guaranteed to get you moving and grooving! “The glorious summer we’ve been experiencing recently is certainly getting people in the mood for a great family day out like the Cosford Food Festival, advance ticket sales are up on previous years which is really encouraging. 2018 is an exciting year for us as the RAF celebrates its centenary and we’ve incorporated this theme into the festival in several ways. We’re delighted to have an RAF Chef on the demo stage as well as personnel showcasing The RAF100 Cookbook on the Tips and Taster stage both days. The RAF recruitment team will also be with us, along with the Cosford and Shawbury Military Wives Choir who will be kickstarting the live music, and not forgetting the Spitfire flypast on Saturday! Ensuring there is plenty to do for the little foodies, Kid’s Corner is an entire area packed with entertainment for youngsters. Kiddy Cook will be running five cookery workshops each day where children will get hands-on decorating cupcakes and biscuits in the shapes of RAF roundels and planes! Spaces are limited to 20 children per session and cost £3 per person, so if you have any future chefs in the family, book now to guarantee your place by visiting www.rafmuseum.org/cosford. Also in Kid’s Corner, children can try their hands at circus skills, create painting using colourful plastic bottle tops, have fun on the RAF STEM bus and of course, no festival would be complete without some face painting and festival glitter! But if all that’s not enough, why not have a go at the craft activity peg planes, enjoy playing with the giant outdoor games or get into the festival spirit with an airbrush tattoo. Artist Spencer Trickett will also be in the Kid’s Corner all weekend signing copies of his RAF inspired books. Actor John Challis, who is best known for playing the character Boycie in the popular BBC sitcom ‘Only Fools and Horses’ will be at festival bringing along a range of his books for people to have signed. Organisers are thrilled to have this local legend at the festival for a second year after proving popular with foodies at last year’s event. The Cosford Food Festival will run from 10am to 5pm on Saturday 21 and Sunday 22 July and admission is just £6 per adult, with family rates available. Tickets to the festival are now available to purchase in advance via the RAF Museum website www.rafmuseum.org/cosford where you will also find a full list of exhibitors. Festival goers will also be able to enjoy exploring the aircraft and exhibits on display at the RAF Museum Cosford – with their wristband on, they can pop in and out of the festival to the Museum throughout the day. In addition to the parking at the Museum, there will be a FREE shuttle bus operating from the large car park at Cosford train station over the festival weekend. There will be two busses running continuously throughout the day and they will drop visitor’s right at the entrance to the festival! Disabled parking is available at the Museum. Keep up to date with the latest festival info by following the event on Facebook/CosfordFoodFestival. A record crowd of 185,000 people enjoyed a feast of flying as the Royal International Air Tattoo staged international celebrations marking the Royal Air Force’s Centenary at RAF Fairford. Other flying highlights included displays by the US Air Force Heritage Flight; the Ukrainian Su-27 Flanker; the Royal Canadian Air Force CF-188 Hornet; the French Aeronavale Rafale M duo; the Italian Frecce Tricolori aerobatic display team and the RAF’s Red Arrows. Visitors on Saturday were treated to a rare flypast by a US Air Force B-2A Spirit stealth bomber that had made the round trip from its base in Missouri, US. In the static aircraft park there were examples of aircraft from around the world including debut appearances by the Embraer KC-390 from Brazil, the Kawasaki C-2 from Japan and the HH-101A CaeSAR tactical helicopter from the Italian Air Force. Just days prior to the airshow, history was made as the first transatlantic flight by a civilian-registered Remotely Piloted Aircraft (RPA) touched down, ushering in a new era in unmanned aviation. The SkyGuardian is the latest version of the General Atomics’ MQ-9 Reaper remotely piloted air system. Capable of flying for up to 40 hours at a time at altitudes of up 40,000ft, when SkyGuardian comes into RAF service it will be known as ‘Protector’. Among the Royal guests in attendance at the Air Tattoo were HRH the Duke of Kent, Patron of the RAF Charitable Trust; HRH Prince Michael of Kent; HRH The Princess Royal and HRH Prince Feisal bin Al Hussein of the Jordanian Royal Family. Guests from the world of politics included the Chancellor of the Exchequer Philip Hammond; the Secretary of State for Defence Gavin Williamson; the Parliamentary Under-secretary of State for Defence People and Veterans, Tobias Ellwood and the Minister for Defence Procurement Guto Bebb. In total, the Air Tattoo hosted 79 military delegations including 64 military chiefs from around the world including Chief of the Air Staff, Air Chief Marshal Sir Stephen Hillier; the First Sea Lord Admiral Sir Philip Jones; Chairman of the NATO Committee, Air Chief Marshal Sir Stuart Peach and Vice-Chief of the Defence Staff, General Sir Gordon Messenger. Among the industry sponsors in attendance were BAE Systems’ CEO Sir Roger Carr; Lockheed Martin CEO Marillyn Hewson; Boeing CEO Leanne Caret; Airbus CEO Tom Enders; Babcock CEO Archie Bethel; Senior Vice President Fujitsu Duncan Tait and Leidos CEO Roger Krone. Celebrities included Carol Vorderman, Sir David Jason, Susannah Reid and vocal group Blake. Air Tattoo Chief Executive Andy Armstrong said he was delighted that so many people had turned up to celebrate the RAF’s centenary at RAF Fairford. 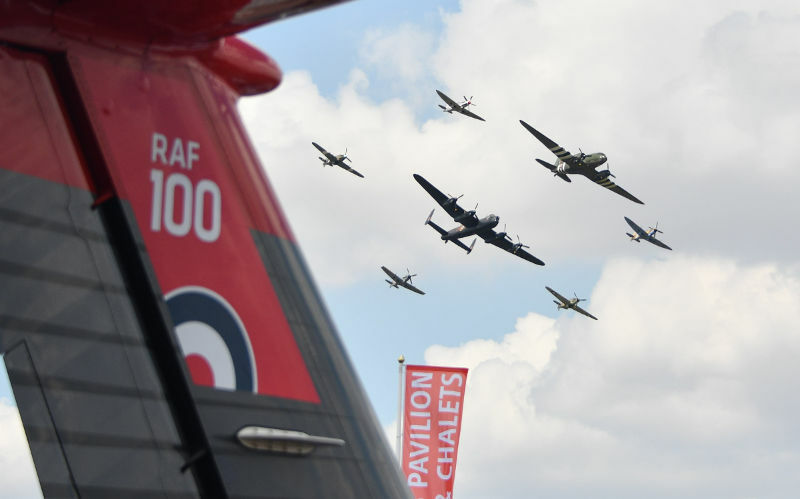 He said: “This year’s airshow has been many years in the planning and I think my team, including our amazing army of 1,500 volunteers, has really delivered something special to the nation. “We’ve enjoyed some spectacular flying in glorious sunshine and a superb range of entertainment on the showground. Of course, it was disappointing we were unable to feature our planned RAF100 flypast on the Friday due to a localised weather front however, everyone understands that safety has to be our number one priority. Next year’s Air Tattoo takes place on July 19-21, 2019. 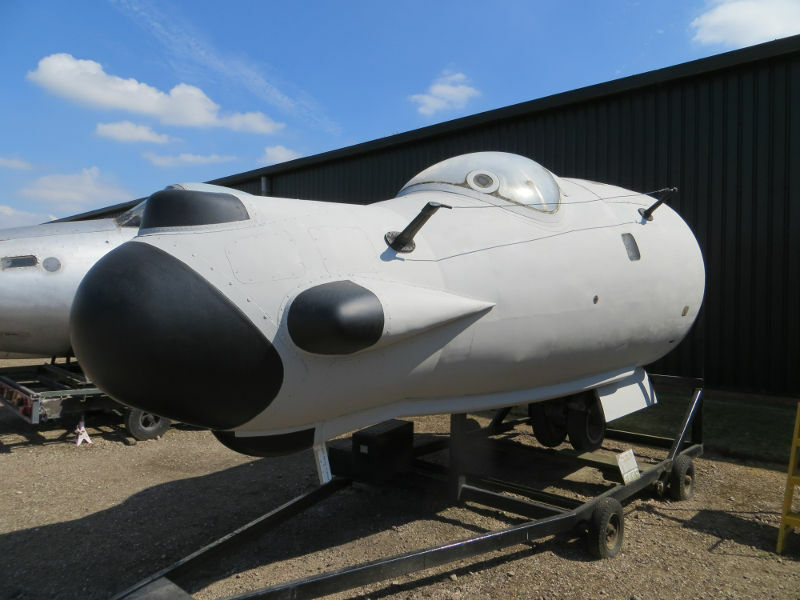 Recent good weather has enabled a number of external repaint projects to proceed with greater pace at the Newark Air Museum. Last autumn work started on de-corroding the English Electric Canberra T.17 cockpit from the former ECM (Electronic Counter Measures) aircraft WH863. The cockpit has now been fully primed and is awaiting the application of new grey/green paint that will return the cockpit to the markings it wore whilst serving with 360 Squadron. 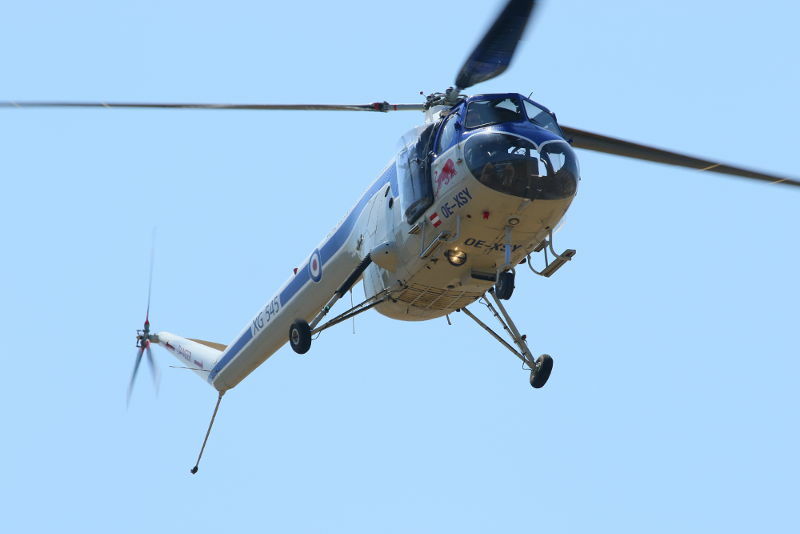 The recently acquired Aerospatiale Puma HC Mk 1 XW208 restoration project has recently received a significant boost in the form of the acquisition of a tail boom. 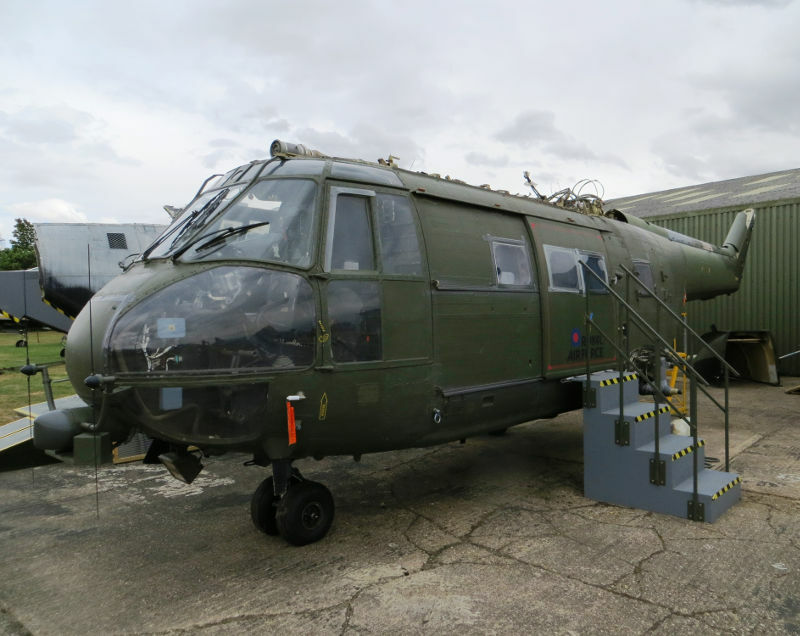 This acquisition was made possible thanks to the generous assistance from the staff and volunteers at East Midlands Aeropark; the project is also befitting from significant input and advice from the wider RAF and UK helicopter community. Elsewhere on the museum site in eastern Nottinghamshire Cessna 310, G-APNJ is also undergoing a repaint. The aircraft is being repainted into a representative USAF colour scheme that the type wore operationally as a U-3 ‘Blue Canoe’ utility communications aircraft. The selected colour scheme is similar to the last civilian colour scheme worn by G-APNJ and it is hoped that the change of markings will stimulate additional interest in this particular aircraft. Visitors to Aerospace Bristol will be able to see the Sycamore up close on Tuesday 10th July and Wednesday 11th July, before watching it take off at 1pm on Thursday 12th July. Filton, Bristol, 10th July 2018: It’s not just football that’s coming home! The world’s only flying Bristol Sycamore helicopter is making a return to the city for three days only. The Sycamore is on display at the new Aerospace Bristol museum this week and will be available for visitors to view from Tuesday 10th July until Thursday. The unique example of a flying Sycamore will then take-off, as museum visitors look on, at 1pm on Thursday. Opened in October 2017 and situated on the historic Filton Airfield, Aerospace Bristol is a new family attraction that tells the story of Bristol’s remarkable aviation heritage. The museum’s star attraction is Concorde Alpha Foxtrot, the last Concorde ever to fly, with visitors able to step aboard Concorde, glimpse into the cockpit, and enjoy a stunning show projected on to the fuselage of the supersonic jet.